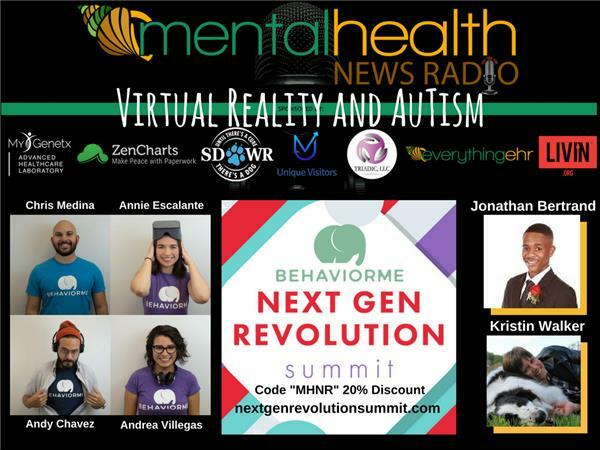 Chris Medina, Andy Chavez, and Annie Escalante join Kristin Walker and Jonathan Bertrand to talk about the Next Gen Revolution Summit coming up November 2017 in Miami, Florida. Our listeners can use the code "MHNR” for a 20% discount off all ticket types. This is THE in person and online summit to attend for anyone interested in ABA, Artificial Intelligence, Human Behavior, Mental Health, Virtual Reality, Autism, and more. We talk about how virtual reality is being used to help those with Autism. These four entrepreneurs created the organization BehaviorMe and are presenting at the summit. BehaviorMe is developing immersive virtual reality simulations for behavioral specialists to treat their clients more effectively and efficiently. Our VR simulations will give practitioners the opportunity to teach basic life skills to individuals with Autism Spectrum Disorder and developmental disabilities in a new, innovative, and effective way. Our roots lay in the behavioral sciences and our passion drives us to help people all over the world.